I've liked all the singles from the album so I figured I'd like this as soon as I got around to listening to it right through. And I wasn't disappointed! I particularly love the variety within the album, it's not one sound the whole way through and they incorporate many different sound, production techniques and instruments. The songwriting is brilliant as are the vocals (although he shouts a lot, I find it to be interesting rather than irritating since many of the tracks are based around chirpy guitar riffs or whatever other instrument they happen to be using).<br><br>In saying that, the heavier tracks still sound awesome - Radioactive is a good example of that but I also liked the heavier sound of Working Man. I didn't dis-like any tracks on the album so it's definitely a high 5 for me, nearly a 6 but I guess something is missing for me. I'm not sure what.<br><br>Standout tracks: It's Time, Radioactive, Bleeding Out, Nothing Left To Say<br><br>EDIT: I now hate several of their songs, including On Top Of The World and Demons so will have to bring it down a little bit. Sehr starkes Album dieser äusserst talentierten Band. Die Songs sprühen vor Spielfreude und Energie, sind ziemlich eingängig und abwechslungsreich. "Radioactive", "Demons" oder "On Top Of The World" halte ich für Meisterwerke, stark! Wieso wird Radioactive erst jetzt ein Hit? Im Frühjahr / Sommer 2012 hat sich niemand dafür interessiert - und jetzt dieser immense Erfolg. Schon komisch wie die Leute ticken. Entsprechend verleidet mir der Song langsam aber sicher aufgrund Dauerbeschallung.<br><br>Die von Alex da Kid produzierten Songs haben alle ein unabstreitbares Hitpotential. Dass sie's auch ohne ihn gut können zeigt z.B. Nothing Left To Say / Rocks oder Working Man.<br><br>Night Visions ist ein grundsolides Album, das auch viele Popfans ansprechen wird. Die werden vor allem an den ersten fünf Songs und Bleeding Out Gefallen finden, den von Alex da Kid produzierten Songs. Als Popfan gefallen mir diese natürlich ebenfalls alle gut, es sind aber nicht die einzigen gelungenen Tracks dieses Albums, wie viele meinen.<br><br>Lieblingssongs: Working Man, Nothing Left to Say / Rocks, Every Night, On Top Of the World, Tiptoe, Radioactive<br><br>Und die Veröffentlichungspolitik ist ein einziger Witz. Wie viele verschiedene Versionen gibt es? 10? Kein Wunder existiert Piraterie. Eigentlich nichtssägend. Kein richtiger Highlight. Radioactive *** ***<br>Tiptoe *** *<br>It's Time *** **<br>Demons *** *<br>On Top Of The World *** *<br>Amsterdam *** *<br>Hear Me *** *<br>Every Night *** *<br>Bleeding Out *** **<br>Underdog *** *<br>Nothing Left To Say / Rocks *** *<br>My Fault *** *<br>Round And Round *** *<br>The River *** *<br>America *** *<br>Selene *** *<br>Cover Up *** *<br>I Don't Mind *** *<br><br>4.2 - 4*<br><br>Von "Night Visions" gibt es ja etliche Versionen... ich habe mir nach etlichem hin- und her endlich für die 18-Track-Version entschieden. Daher unterscheidet sich meine Tracklist etwas von der Liste oben...<br><br>Das Debut-Album der US-Band Imagine Dragons ist sehr gut geraten. Es ist relativ eingängig und man kann es ohne grosse Probleme ganz durchhören. 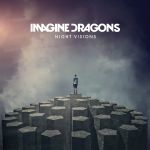 Leider fehlen aber die ganz grossen Hit auf "Night Visions" und wer weitere Kracher wie "Radioactive" erwartet, wird grösstenteils enttäuscht werden. Dafür gibt es aber auch keine Hänger.<br><br>Während ich hoffe dass "Bleeding Out" noch als Single veröffentlicht wird, wurden mit den bekannten Singles "It's Time", "On Top Of The World" und "Demons" die nächstbesten Tracks bereits ausgekoppelt. Radioactive: 4*<br>Tiptoe: 3*<br>It's Time: 5*<br>Demons: 5*<br>On Top Of The World: 6*<br>Amsterdam: 3*<br>Hear Me: 4*<br>Every Night: 4*<br>Bleeding Out: 5*<br>Underdog: 3*<br>Nothing Left To Say: 4*<br>Cha-Ching: 4*<br>Working Man: 4*<br><br>Imagine Dragons sind im Moment gut mit "Radioactive" unterwegs...was für mich ein wenig fraglich ist..."On Top Of The World" scheint nur in meinem Heimatland, Portugal Erfolg zu haben!<br>Irgendwie scheint es mir dass Sie "On Top Of The World" für das portugieische Volk geschrieben haben, dort Nr1 für mehrere Wochen...und es scheint einer der grössten Hits des Jahres zu werden! Was ich total nachvollziehen kann, wie fast jeder Portugiese liebe ich den Song! Ist auch mein Album-Highlight! This was quite an enjoyable album but not quite enough that I think I'll purchase it. I do love the singles, and aside from those there were several oher tracks which were great, and while there were no songs here I disliked, there were a great number which were just solid but unspectacular. With repeated listens I'd probably like those more but I don't exactly need more CD's! Very close to giving this a 5 but I'll go with 4. Since it seems like everyone in the universe apart from people who seem to actually care about music seems to be in awe of them making them this year's biggest rock band, I might as well gives this record a shot to see what there is to it. A lot of talk about the sonic diversity seems to have been made, with each song sneaking a sound from some genre or whatever. This barely hides the fact that it's basically one really average, cheesy and formulaic song repeated 10 times or more which gets really tiring and predictable. There's no way in hell that anyone could seriously consider this innovative at all.<br><br>So the production I guess that's both the biggest strength and weakness to this because obviously Alex Da Kid was trying to give as much imagination (indeed) as he could to such sterile songs and occasionally with a gem like 'It's Time' they can write a song that actually lives up to the excessive production, unfortunately it often muscles the band itself out of the picture or shows how generic their songwriting is with truly horrible tunes like 'Demons' and 'Every Night'. It's only at the very end with 'Rocks' (no, that does not count the 'radical' 6-minute long song before it) that they show any other ways of writing a song.<br><br>Funnily enough the over-saturated 'Radioactive' is actually a relative highlight on this. Starkes, solides Album, das allerdings die höchsten Ansprüche nicht befriedigen kann. I feel like they're a bit overrated. I really enjoyed Radioactive, but the rest of their album kind of disappoints in comparison. Bis auf "It's time" und den "Working man", gibt mir das alles weniger.<br>#36 der österreichischen Jahreswertung. Abgesehen von der ersten Single 'Radioactive' sind alle Songs gut bis stark. Dieses Album hat mich doch stark positiv überrascht. Abgesehen von "Underdog" überzeugt eigentlich wirklich jeder Track. Dazu kommen die besonders starken "Radioactive", "It's time", "Demons", "Amsterdam" und "Bleeding out". Am 23.02.2014 habe ich die einzelnen Titel bewertet, aber die Albumbewertung vergessen.<br>Das Album gefiel mir sehr gut, nur die letzten Titel nicht ganz so. Das Album als ganzes nicht so schlimm aber vereinzelte Lieder daraus wurden bis zum Erbrechen überall gespielt. I had a go and listen to this album from Imagine Dragons. And overall I just find it a bit too hard to follow. I was disappointed that they try other elements to connect into their rock scenario. According to the actual website Wikipedia, it says the substance on this album has got hip hop. And where can I find it? Absolutely nothing. <br><br>Surprisingly I still love Radioactive and On Top Of The World. As the rest, it's underrated and very difficult to comprehend which tracks are the best.